Wow. The Return of the King brings The Lord of the Rings saga to a masterful close. What began relatively quietly four years ago ends with a huge bang, with millions of people across the world waiting with baited breath. This saga has redefined epic storytelling, by adroitly combining stunning special effects with a larger-than-life story and colorful characters. It feels grand yet intimate at the same time. These three films have also cemented catapulted the statuses of director Peter Jackson and actor Orlando Bloom (Pirates of the Caribbean, The Two Towers), both of whom were relatively unknown before these films. The Return of the King is a good film on its own and as the final chapter of the trilogy, and Jackson (The Fellowship of the Ring, The Two Towers) is the person behind it all. From his past experience, it seemed pretty far-fetched that he had the skill to tackle J.R.R. Tolkien's novels. Looking back, it was his vision and drive that pulled everything together. Along with Frances Walsh and Philippa Boyens, he adapted the three novels and went off to his home country of New Zealand to scout exotic locations. Jackson clearly loved the material, and his devotion shows in the final product. Yes, he made some minor changes to the story, but everything was done to make it fit for the film genre, and unlike many other films, Jackson cared that the changes he made would still make sense. The Return of the King begins with a flashback, showing how Smeagol (Andy Serkis, The Two Towers, 24 Hour Party People) discovered the Ring and eventually became Gollum. Then, the film picks up where The Two Towers left off, steadily building upon itself as the entire world of Middle Earth prepares for war. The forces of Sauron and Mordor are intent on attacking the seven-leveled city of Minas Tirith in the land of Gondor, ruled by an increasingly unstable Denethor (John Noble, The Two Towers, The Monkey's Mask). He is reluctant to go war, despite Gandalf's (Ian McKellan, The Two Towers, X2: X-Men United) entreaties. Denethor is the Steward of Gondor, ruling in the true King's stead until his return. 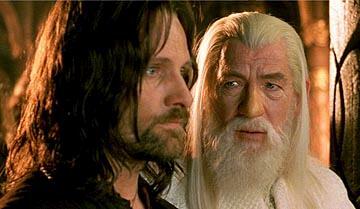 Aragorn, (Viggo Mortensen, The Two Towers, The Fellowship of the Ring), the true King, is still in the Kingdom of Rohan, trying to convince Theoden (Bernard Hill, Gothika, The Two Towers) to go to Gondor's aid. Meanwhile, Gollum is leading Frodo (Elijah Wood, The Two Towers, Spy Kids 3-D) and Sam (Sean Astin, The Two Towers, The Fellowship of the Ring) ever closer to Mount Doom, where Frodo must destroy the Ring. 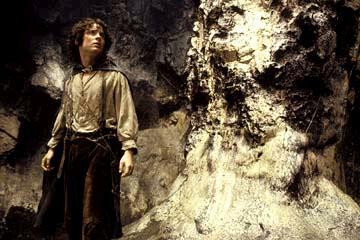 The power of the Ring is draining the life out of Frodo, leaving him a paranoid, weary, husk of a hobbit. Sam is finding it more difficult keep them moving and try to keep Gollum at arm's length. Jackson switches between these two principal stories, and events reach a fever pitch once the attack on Gondor begins. Unlike some other recent films (cough, The Matrix Revolutions, cough), Jackson can sustain an extended battle sequence without eliciting yawns. This is because Jackson knows that it is important to show both the grand scope of the battle and how it affects individual participants. Because there are so many main characters, many of the smaller ones have obligatory screen time and little else, but Mortensen and Miranda Otto (The Two Towers, Human Nature) do have some nice scenes, both apart and together. Astin is the biggest surprise of the film. As Sam, he was primarily relegated to sidekick status in the two previous films. Here, he rises to the occasion by serving as the emotional core of the story. Sam is trying to protect Frodo from the Ring and Gollum, and trying to push them forward at the same time. Astin is the character that people can most relate to, and by giving him a spotlight, Jackson makes the world of Middle Earth seem somewhat closer to this one. Again, Jackson brings this world to vivid life. The best example is when the city of Minas Tirith lights a series of signal fires. When a far-off outpost sees a fire, they light their own, causing another outpost even further away to light their fire, all the way to Rohan. The camera smoothly sweeps over the mountains, giving the illusion of an incredible distance. Rohan and Minas Tirith exist on large grassy plains, while Mordor is a bleak, rocky wasteland. There are small elements that do not work. The love story between Arwen (Liv Tyler, The Two Towers, The Fellowship of the Ring) is one of the things that Jackson, Walsh, and Boyens added, and never feels 'real.' It does give some depth to the Aragorn character, but at times is more of a diversion than anything else. Moreover, the world of Middle Earth is so rich in history and politics and the roles of each member of the fellowship are so complex that sometimes, unless one has read the book, characters are spouting off names, places, and tasks that are unclear. To his credit, Jackson does make things clear, and these are small faults hidden by pretty much everything else. As The Return of the King comes to a close, it ends. Then it ends again, then again. It may feel like the endings drag on for a while, but there are many things that need to come to a close. Jackson is not only finishing this movie, he is finishing the entire saga, and he deserves to take his time in saying his goodbyes. He does so with class and emotion, and it is a fitting ending. 3 hours, 20 minutes, Rated PG-13 for intense epic battle sequences and frightening images.